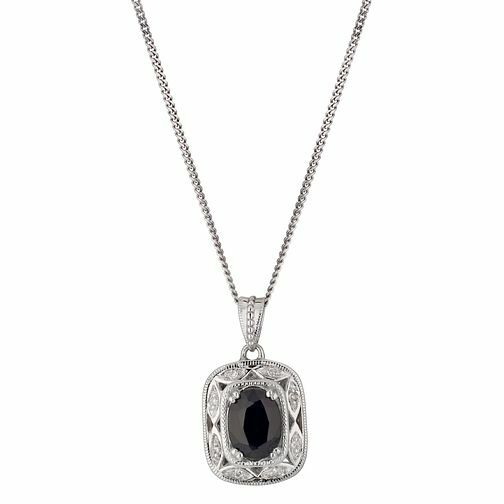 With a sultry, deep sapphire at its centre, this stunning pendant is surrounded by an ornate, vintage inspired setting in sterling silver. Finished with sparkling diamonds, this is a beautiful piece of neckwear offering a glamorous touch of elegance. Sterling Silver Sapphire & Diamond Vintage Pendant is rated 5.0 out of 5 by 1. Rated 5 out of 5 by Anonymous from Great Value A perfect piece of jewelry for any occasion,i bought this for an anniversary gift.Well made beautiful design and great value. Delivered fast and efficiently ,will use this company again.